As the Hungarian Parliament building can not be visited without a guide it is highly recommended to plan ahead the tour date in Budapest. All the more as you can book conveniently online, in advance, without having to queue for a limited leftover tickets which may not even suit your plans. Guided tours in the Hungarian Parliament, Budapest are on a daily basis in most major European languages. Please note that during parliamentary sessions, and other official receptions, the guided tours in the Parliament are cancelled or postponed without further notice. 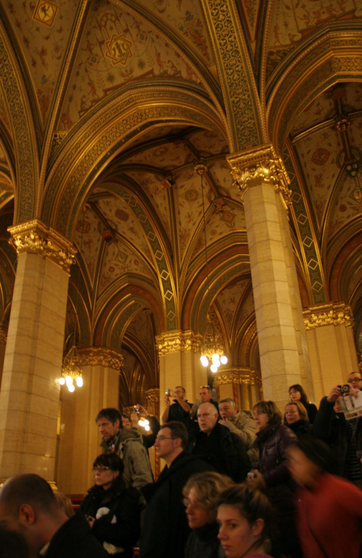 Guided tours in the Hungarian Parliament building in Budapest are offered in various settings. Please note that as of January 2013, Budapest Parliament tours and parliamentary visits are no longer free of charge to EU citizens. Also, the Parliament is closed on holidays. The cheapest and by far the most efficient way to visit the Parliament is to book a tour online via Jegymester.hu, the official and exclusive ticket vendor to the Budapest Parliament building. Alternatively, you can go to the Visitor Centre of the Hungarian Parliament, queue for the tickets, if there are any left for that day in your preferred language. On Jegymester, individual Budapest Parliament visitors can pre-book / buy tickets for visiting the Hungarian Parliament building. The tour is available in 8 languages: Hungarian, English, French, Hebrew, German, Russian, Italian and Spanish. When booking your ticket in advance, you will be prompted to pick your preferred tour language too. 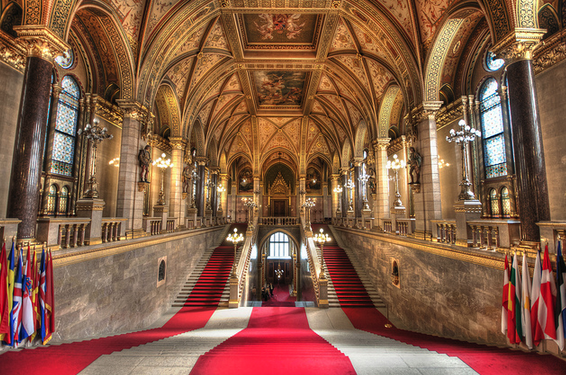 During your Parliament visit, you will see the spectacular Main Staircase, the Hungarian Coronation Jewels in the Dome Hall, the Old Upper House Hall of the bicameral Hungarian Parliament, as well as the Lounge. The tour will include information about the present operational rules and procedures of the Hungarian Parliament. Please note that the 45 min Parliament building tour includes the security check (approx. 10-15 min). The Hungarian Parliament tours must be booked in advance due to the limited number of places available on a given day. The tours include both a visit and guided tour around the Hungarian Parliament building, and a guided tour inside the Parliament with a visit to the Hungarian Crown Jewels. Most of the beauties inside can also be photographed, however, the security check in section and the Crown Jewels Dome Hall are two notable exceptions where taking photos is not allowed (in other parts of the tour route inside the Parliament building it is allowed). NOTE: The Hungarian Parliament reserves the right to cancel any Parliament visits without further notice. If you have booked your ticket online, you will be refunded if the Parliament cancels the tour. Short guided tours in the Parliament are also offered for EU citizens. Show your EU passport to proved your EU member citizenship and you can have a free guided tour. You still need to book in advance if you want to avoid the long waiting lines at the Hungarian Parliament. Tickets for the guided tours can be bought at Gate 10 (Gate X) a quarter of an hour earlier the tour. Parliament will carry out a routine security check. You can only enter the Parliament if you let the guards check you. Just like at any airport, this is a routine check for the security of the building, the Coronation Jewels, and the ultimate political institution of the Hungarian nation. You can speed up the process of the security check if you co-operate with the Guards. Guards will need to check larger bags, backpacks, packages, so if you can, please visit the Budapest Parliament without bulky luggage or carry on bag. What is Forbidden in the Hungarian Parliament? Any harmful object that qualifies as a weapon is forbidden to be taken inside the building of the Hungarian Parliament. The list of forbidden items are much like the list of items on airplanes: pocket knife, knife, gas spray, etc. Needless to say, weapons, guns, explosives, pyrotechnic devices are absolutely forbidden. It is forbidden to take photos in 2 sensitive areas of the Parliament tour: first, the security check point, second the Dome of the Hungarian Crown Jewels. Visitors of the Hungarian Parliament building may change the previously booked time of their tour without an additional charge if they contact the Parliament Tourism department and Jegymester.hu 3 days before the date of the visit (the new date of the visit must be a later date than the original though). On Jegymester.hu please use the administrative interface. You can also contact the Parliament Tourism Office via email (idegenforgalom@parlament.hu). Please note that the price of cancelled tours is not refunded. The Hungarian Parliament building visit can be cancelled due to programs of the Parliament or state protocol events even directly before the visit. If the tour is cancelled on behalf of the Hungarian Parliament, the tour price will be refunded to the tourists. The Office of the National Assembly will release the news of cancellation on the official website, Parlament.hu. In addition, cancelled dates are published on the booking system interface of Jegymester.hu within the shortest possible time. If you have submitted an email address during your Parliament tour registration, you will be informed via email. In this case the already paid admission fees will be reimbursed. The Visitor Centre is the tourism hub of the Hungarian Parliament with a cafe and gift shop. 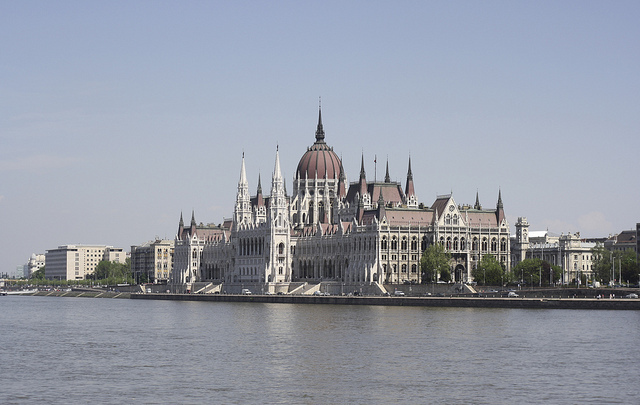 You can find more information about the Visitor Centre of the Hungarian Parliament here.